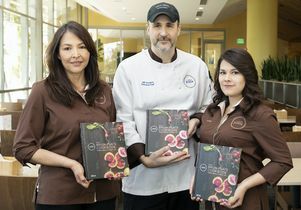 UCLA Bruin Plate’s Guadalupe Morales, Chef Jeff Viviano and Lynley Fleak were three key members of the team who put together the cookbook. 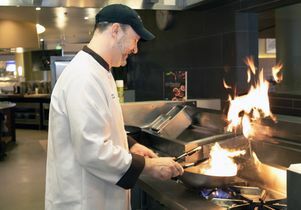 During any given shift at Bruin Plate, students would frequently ask dining manager Guadalupe Morales for the recipes of dishes like cioppino flatbreads and mustard-maple pork tenderloins. While talking with her boss, Pete Angelis, Morales joked that they should make a cookbook out of the dining hall’s eclectic menu. But Angelis saw opportunity in this moment of jest. Angelis, UCLA’s assistant vice chancellor of housing and hospitality services, met with culinary and marketing teams to explore the feasibility of designing a cookbook. The marketing team felt up to the challenge given their daily work on websites, logos and social media. Lynley Fleak and Magyn Kydd, who work for housing and hospitality services, brought particularly useful skills to the project. Both had past experience with book publishing and Fleak had even worked specifically with cookbook writing. “Although a cookbook is not something we work on every day, it was something we could easily accomplish with such a capable team,” said Al Ferrone, senior director of food and beverage in housing and hospitality services. 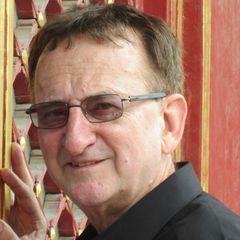 Work began on the book in January, 2018. 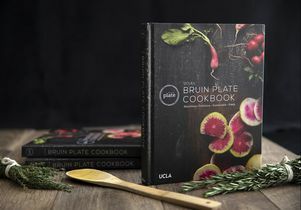 After eight busy months, UCLA’s Bruin Plate Cookbook was complete. Its 220 pages are full of mouth-watering images that complement well-structured recipes. The book not only feels professionally assembled, it goes so far as to make the food look like art; the assortment, color and freshness in every picture highlight the cookbook’s mission to show what residence hall food can be at its finest. Take, for example the picture that accompanies the bison burger with blackberries, blue cheese and pickled onions. 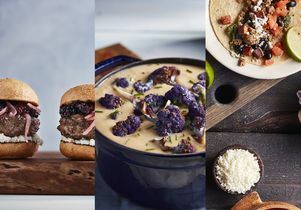 The light pink onions and white blue cheese starkly contrast the dark blackberries, and their presence is centered around a charred-brown burger and golden toasted buns. The dish looks almost too good to eat. 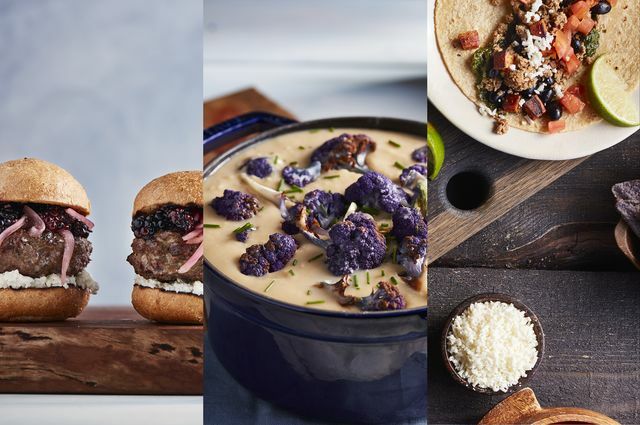 Bison burger sliders, roasted cauliflower soup and tacos from the Bruin Plate Cookbook. With recipes ranging from crunchy French toast with pineapple salsa to turkey, black bean and yam tacos with Swiss chard pesto, there is truly something delicious in the cookbook for everyone to enjoy. The full-color, hardcover book costs $34.95 and is available online and in the UCLA store in the Ackerman Student Union. Proceeds from the sale of the book support food insecurity programs at UCLA, furthering the positive impact of the project. UCLA students and staff can purchase the book at a 30 percent discount. Overall, the book was designed to highlight the service areas inside Bruin Plate and to feature the most popular items from each platform. The book’s introduction explains the structure that inspired its organization. As a result, the book thus simulates the dining hall experience within its pages. The cookbook required significant collaboration, Angelis said. Logistics such as the vision for the finished cookbook, how many recipes to include, the photography and budget constraints had to be communicated among the recipe development, marketing, Bruin Plate management and Bruin Plate culinary teams. “The key was breaking it down into manageable chunks and prioritizing the tasks involved,” Ferrone said. This is just what they did, tackling concept design, recipe size conversion, photoshoot and food styling, copywriting, book layout and production, copyediting and proofreading and print management. Of particular interest was recipe size conversion. The Bruin Plate dining hall recipes are designed to feed hundreds, if not thousands, of students efficiently. All recipes had to be converted to serve only a few people. “Executive chef Jeff Viviano and executive sous chefs Anthony Ornelas and Brenda Ocampo took very precise ingredient measurements, determined exact cooking times, and wrote detailed notes throughout the process in order to ensure precision and accuracy of the recipes,” Ferrone said. Which recipes would undergo this transformation required careful consideration. Every recipe was well-tested before being introduced to the dining hall or considered for the cookbook. In Ferrone’s own words, the process is to “test, test and test again.” The team took into account if their intended audience would be able to get hold of the ingredients, whether they would have the ability, equipment and time to cook the recipes, and the popularity of the recipes amongst students. Several popular recipes, such as the chipotle chicken bowl, mushroom spinach lasagna and wheatballs with linguini, were omitted due to their complexity. Recipes such as these required too many sub-recipes to reasonably be included. The final chapter of the book is dedicated to basics which appear in several main recipes, such as pickled red onions, wheat berries and balsamic glaze. It is a reference section that empowers readers to deviate from recipes and get creative in the kitchen, Angelis said. In this way, the book serves as a work of nutrition education — a fitting function for a cookbook published by a university. 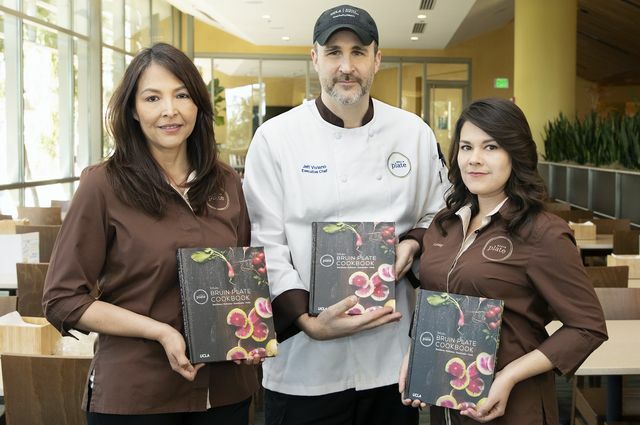 UCLA Bruin Plate’s Guadalupe Morales, Chef Jeff Viviano and Lynley Fleak. Pictures of bison burger sliders, roasted cauliflower soup and tacos from the Bruin Plate Cookbook.